Can you identify any of these people?? They are family and/or friends of the Bond, Edwards &/or Pascoes. The above are both tintype, could be from IN? The 2 rows are all tintype, could be from IN? The 1st Two pictures could be Ellen (Goldsmith) Bond. Row One: picture 1, unknown place; picture 2, 14 Grant Ave. San Francisco, Cal. Row Two: picture 1, DINISON, Elite Studio Pomona, Cal. ; picture 2, Hardy, Pomona, Cal. ; picture 3, Schwichtenbery, Avis Bldg. next to Post Office, Pomona, Cal. ; picture 4, Elite Studio, J. Hardy Prop., A. W. Lohn, Oper., Pomona, Cal. ; picture 5, Elite Studio, Denison & Howard, Pomona, Cal. Picture 3 could be Annie (Ditton) Pascoe & 5 one of her daughters. Row Three: picture 1 & 2, Stanton & Burdick, 119-129 North Main St., Los Angeles, Cal. 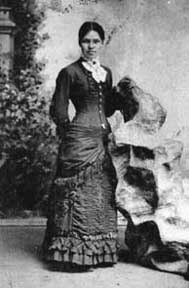 All photos were in the same photo album belonging to Cornelia Edwards Bond. Probably taken circa 1888 to1906.